The holiday season is now in full swing, and the Tabernacle Cub Scouts are doing everything in their power to make sure no one has to endure them with an empty stomach. 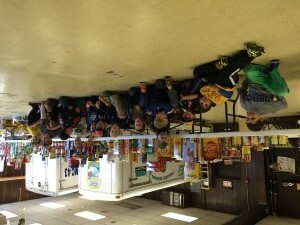 Pack 439 participated in the “Scouting for Food Drive” endorsed by the Boy Scouts of America national office. The pack has participated for many years in this service project, collecting food for the community. “The Scouts learn that being a part of the community sometimes means doing for others, and during the holiday season, we want all families to feel safe and have the things they need,” Pack 439 Committee Chair Judy Sailer said. A few years ago, the father of two Scouts in the troop, Dave Burgess, suggested the Pack contacted the ShopRite of Medford to see how they could help. Burgess got together with the ShopRite management and they agreed to let the Cub Scouts stand in the lobby of the store to hand out flyers and explain what they were doing for their food drive. The Scouts also stood at the exits to collect any donations after shoppers were done making their purchases. “The shoppers have been very generous with their donations filling several shopping carts each year,” Pack Master Keith Zane said. The collected food was then transported to the Tabernacle Community Center where it was sorted into piles and taken to the Church of the Holy Eucharist, where it was then used to fill the food pantry and Thanksgiving dinner baskets. “There were six tables stacked up with food. It was an enormous amount donated to Holy Eucharist, and then the day after, we found out that Tabernacle United Methodist pantry was empty and our families stepped up again to take care of them,” Sailer said. Zane could not say enough about how helpful Zallies Shoprite was throughout the process this year and during food drives in past years. When he would go shopping there in his personal time, he would notice signs they had printed and placed around the store letting their shoppers know which food was acceptable for the Scout food drive. He also attributed the success of the food drive to the parents of the Scouts who voluntarily got involved. The group sets out to have at least one service project every month for the Scouts. They also participated in the Chatsworth road clean up and next month plan to bake goods, gather them at the community center and fill a tin with a dozen cookies to go with Christmas dinner baskets.